The Creative District is a hotbed of diversity where east meets west and the old sits with the new. The Bang Rak side in particular holds clues to the area’s European roots. Go to Exit 1 of Saphan Taksin BTS Station. Begin at a large wall painting in front of you. In early 2016, BUKRUK Urban Arts Festival transformed the neighborhood by bringing international artists to Bangkok to paint walls. Dutch artist Daan Botlek was given a monumental 80-meter wall next to one of Bangkok’s busiest transportation nodes. The result is a thought provoking and mesmerizing mural of a massive character interacting with the environment. This Hainan shrine from the late 1800s was built in memory of 108 Chinese travelers who sailed for Bang Rak but were killed in Vietnam after being mistaken for pirates. Today, many still pray at the shrine to receive blessings from several gods there, including the well-known Guan Yin and Tuptim. This mosque, while modest, is over a century old and is a testament to Muslims settling down in Bang Rak in an earlier period. The Islamic community became a presence in the area during King Rama V’s reign and constructed the mosque in the early 1900s. 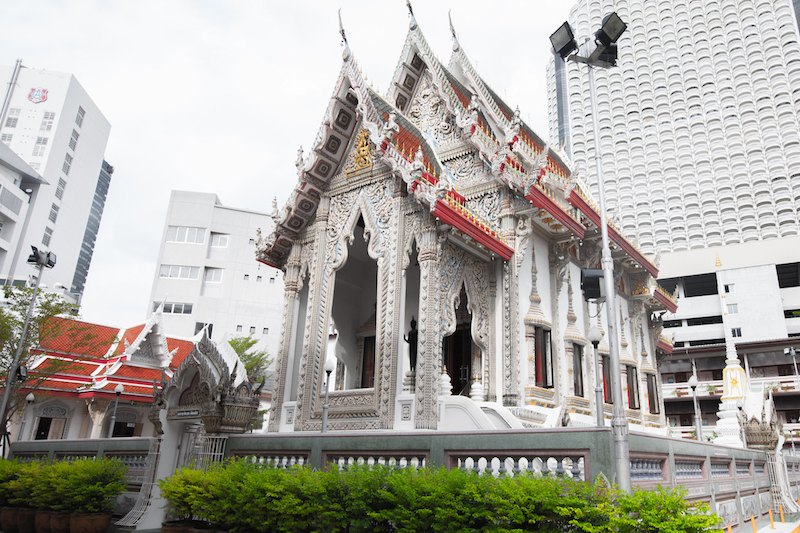 Every community in Bangkok has two hearts: its house of worship and market. Bang Rak Market provides the locals with their meats and produce and hosts several street food stalls. If you are here early enough, you might glimpse locals giving alms to monks from a nearby temple for blessings in return. Extremely famous for its Thai desserts, this nonchalant shop attracts Bangkokians far and wide to come and buy local sweets, including foi thong, thong yip, thong yod, and khanom chan. Select a few to snack on your walk and for later. 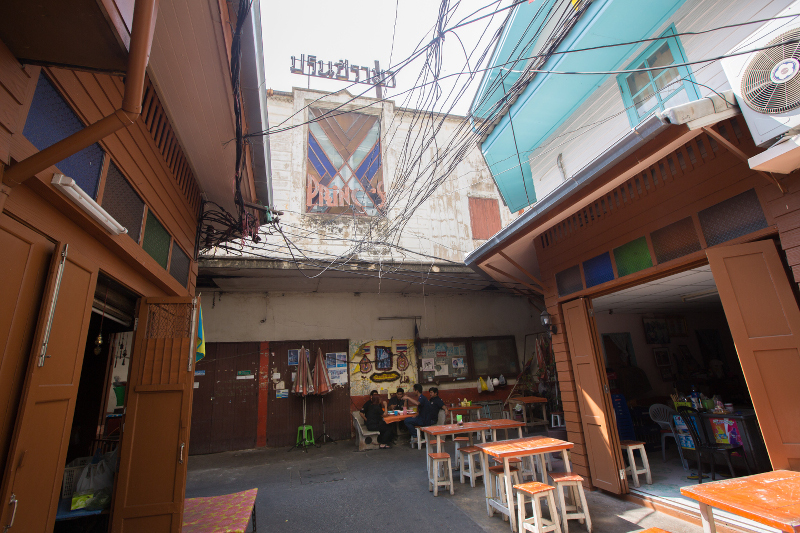 This hidden structure surrounded by shophouses on all four sides is one of Bangkok’s oldest stand-alone cinemas. In its heyday before falling into disrepair, Prince Rama Theater showcased both films and live performances. The theater has been revived once more into a homestay accommodation. Turn left to walk around to its northern side to see its unique art deco sign near the top the of the structure. While most temples are decorated in gold, Wat Suan Phlu instead chooses a blue hue to accent its mostly white façade and carvings. The result is a unique Thai Buddhist temple that is to be noted for its details, especially on its gables. Community temples often act as an education center as well so be prepared to bump into local children there for school in the temple’s courtyard. Cool down and refresh yourself in this cozy café, now a meeting place for many of the youngsters in the area. The café is a fine example of how Bangkokians are now retrofitting older shophouses for new uses. 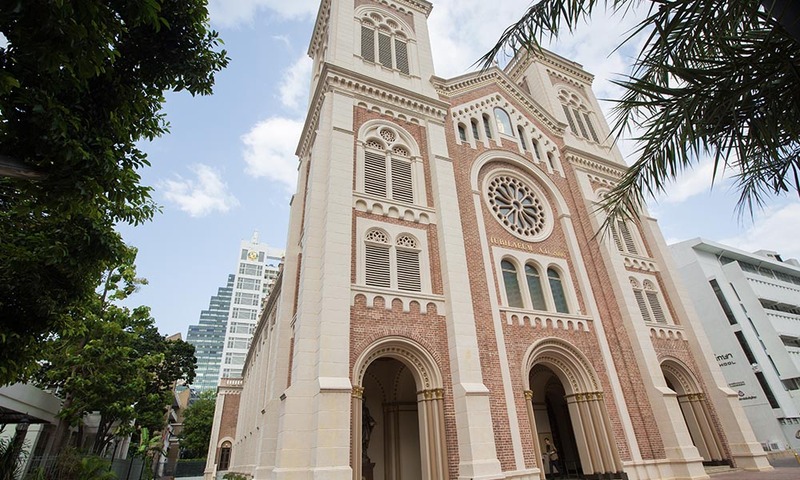 This 19th century Romanesque house of worship is the principal Roman Catholic church of Thailand. While its exterior looks relatively new due to renovations, the church’s interior still exudes an aged aura. Instantly recognizable by its European architecture, this grand white structure was once the headquarters of the Danish East Asiatic Company. Hans Niels Andersen discovered a need for passenger and freight service lines between Copenhagen and Bangkok and founded the company in late 1800s. 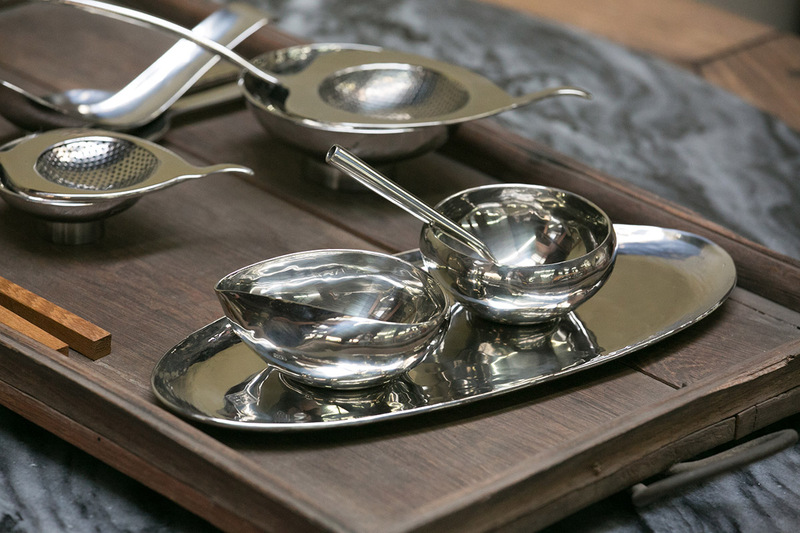 This Thai craft store specializes in silverware and shapes almost every item by hand. The local family that runs the enterprise is entirely focused on craftsmanship and quality and shies away from anything flashy that might distract patrons from their products. As you shop, ask the storekeepers on how some of the items are made and you are sure to get an in-depth answer. 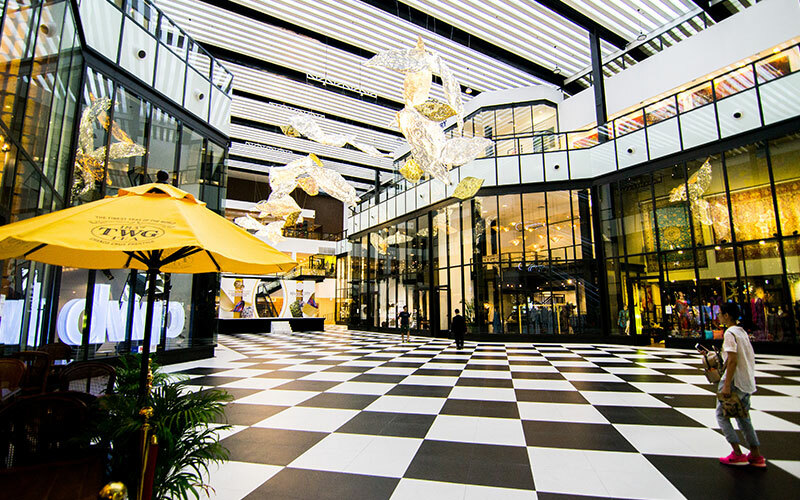 The first incarnation of this antique mall was Falck and Beidek department store, one of the first western shopping complex in Bangkok in late 1800s. While the shopping center targets a niche market, anyone can still visit and get a historical experience. 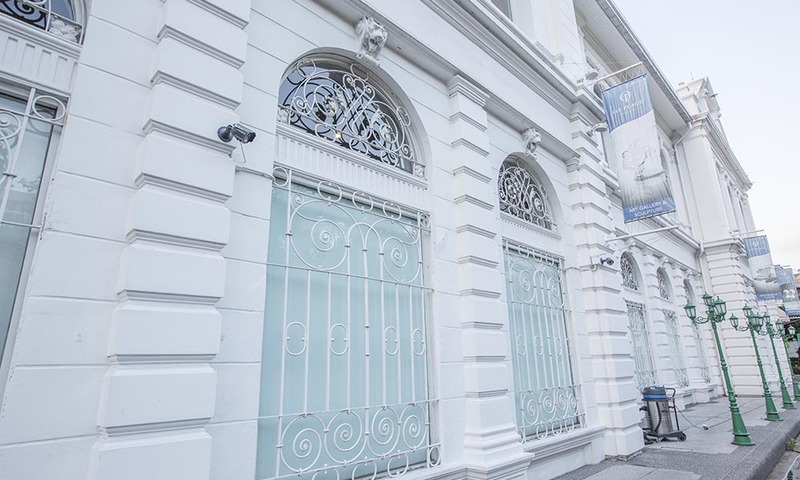 Marvel at building’s preserved exterior, photographs of old Bangkok lining the walls of its ground floor, and the still functioning original elevator. This green oasis was once home to Dr. Boonsoong Lekagul, Thailand’s pioneering conservationist and environmentalist. It is now host to a few eclectic shops, including ATTA Gallery and Serindia Gallery, both of which are part of a growing community of creatives in the area bringing works of artists to the public. France is one of Thailand’s oldest partners in Europe, going way back when a diplomatic delegation sent there from Siam in 1684. Today, the Embassy of France is a symbol of that relationship here in the capital. Its architecture pay homage to and is an interpretation of local traditional Thai houses. This local neighborhood eatery is popular amongst those who live and work in the area and specializes in Thai Muslim cuisine. Take a break from the heat and re-energize yourself with a hearty and affordable meal that is a departure from your typical Thai dishes. Arguably one of the most beautiful buildings on the river’s edge in Bangkok, the Old Customs House points to Bang Rak’s historical significance as a trading area and European quarters. This is the point where shipped goods have to go through. The structure was designed by Italian architect Joachim Grassi, who lent his creativity to construction of many important buildings in Bangkok. 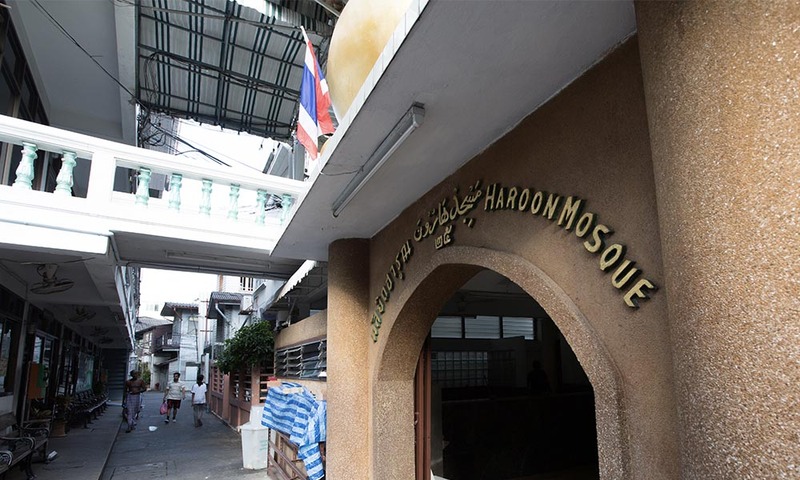 Haroon Mosque is one of Bangkok’s more significant mosques, with a history that showcases migration within the region in the 1800s. Its story crosses three generations, starting with an Indonesian-Arab trader Musa Bafadel arriving in Bang Rak in 1837 and ending with his grandson being responsible for the mosque as it stands today. This landmark building of a brutalist nature once served as the center where all posts were received and sent out. Today, the building has been revived as a creative hub and office of Thailand Creative and Design Center. Enter the lobby on the left side entrance and head up to the rooftop get a view of Bangkok’s skyline. The Embassy of Portugal participated in BUKRUK Urban Arts Festival by giving its wall to Thai artists to work on. Kult, Lolay, Sabek, Alex Face, and more joined forces to create a collection on a single wall, showcasing homegrown talent and techniques. Note: beware of touts selling longtail boat tours near the wall. Warehouse 30 is part of a new wave of developments in the area that’s revitalizing the area. This mix-used compound is made up of old warehouses that has been renovated and retrofitted for shops, cafes, a spa, an event space, a co-working hub, and more. 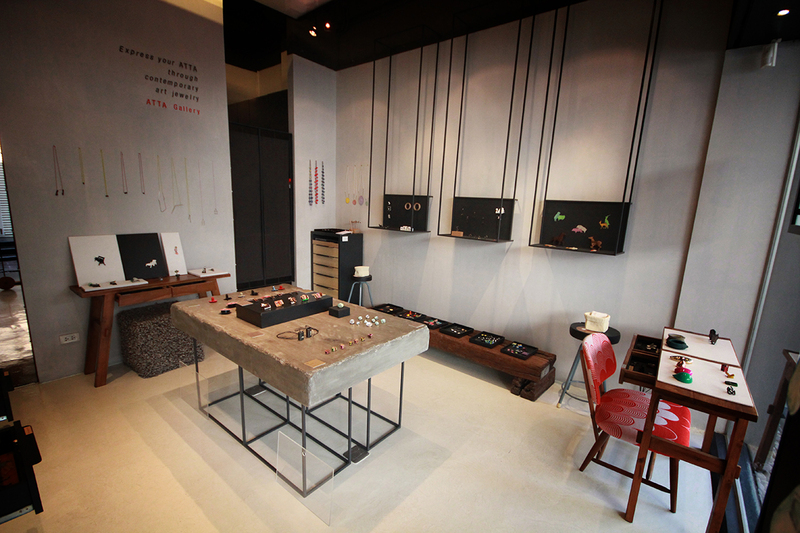 Take a break at Summer Heath or admire handcrafted tables at P.tendercool. 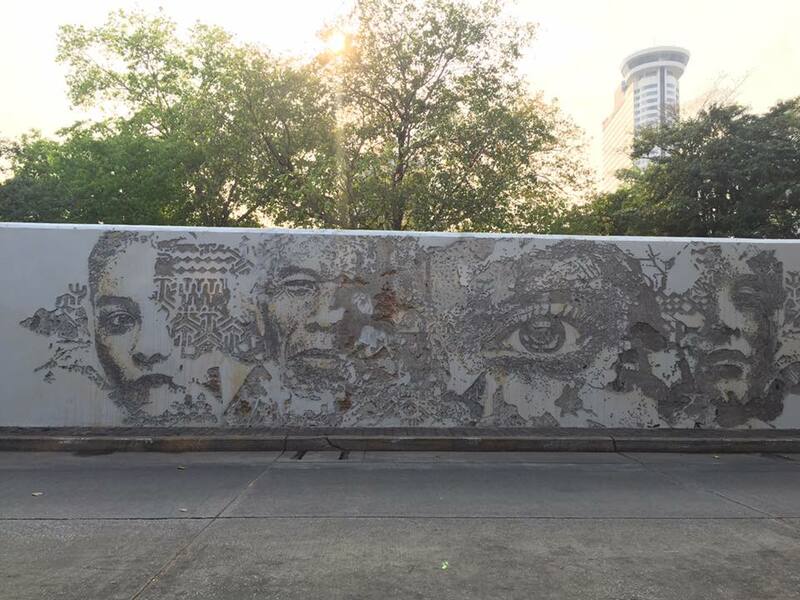 In 2017, Portuguese artist Vhils came to Bangkok to show his groundbreaking carving technique. Instead of adding to the wall, Vhils strips away to reveal what’s underneath. His work on the Embassy of Portugal wall marries what he has seen in Bang Rak and representations of Portugal into a single image. Preserved and renovated completely in 2016, this building is of historical significance. It was designed of neoclassical architecture, which is clearly evident from its front pediment. Built in the early 1900s, it housed Societe Francaise des Distilleries de l’Indochine (SFDI), a French Corporation that managed alcohol production in Indochina. In 1984, with Baby Boomers coming of age with their taste for collectibles, River City opened its doors as the go-to antique market and auction house. It has stayed true to its function and is home to a variety of dealers. Over recent years though, River City has begun to draw in contemporary art shops to cater to newer generations. Stop in here for drinks, food, and exhibitions. 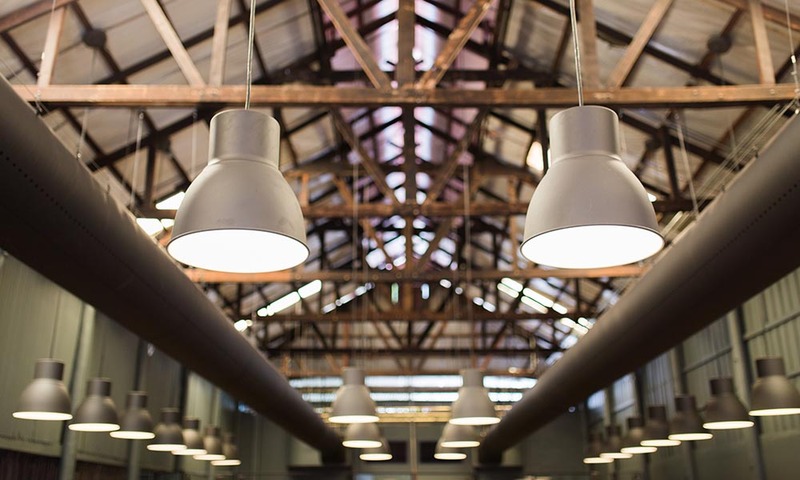 Originally a set of unused warehouses, Jam Factory was converted into an architecture firm’s head office. The compound had plenty of space to welcome other businesses, such as restaurants, a bookstore, a café, and a lifestyle shop. The result is a great mixed-use area that’s popular with the next generation. Finish your walking tour here and wind down before going to your next destination. To get back to Saphan Taksin BTS station, you can get back onto the river crossing ferry and walk back towards House No. 1. Opposite the house is an alley leading to the Si Phraya public boat pier. 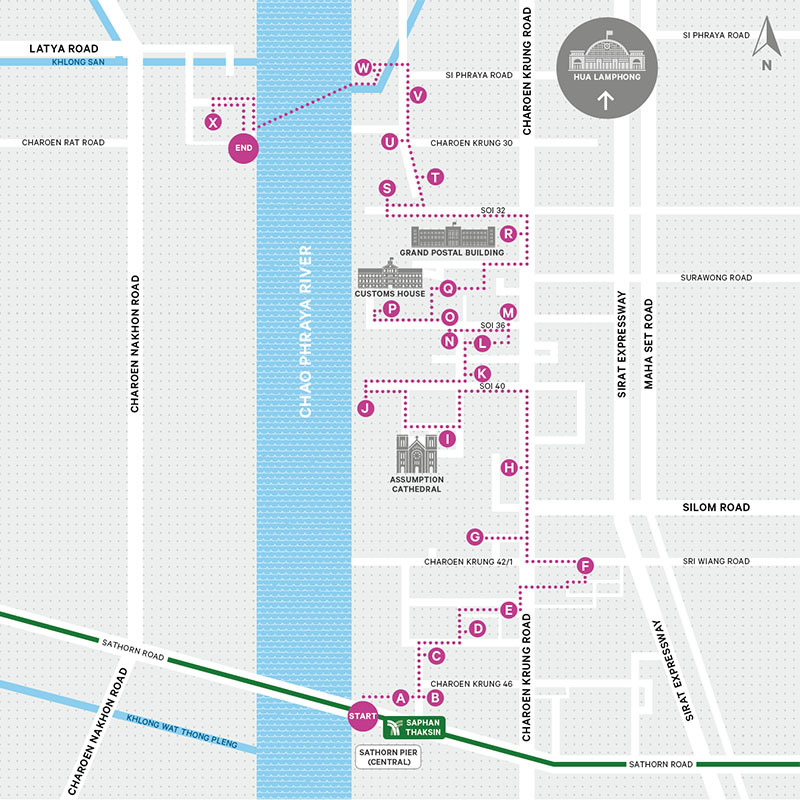 Take an orange flag public boat to Sathon Pier and walk to the BTS station.